rebellion: mer-ee' (H4805); from H4784; bitterness, i.e. (figuratively) rebellion; concretely, bitter, or rebellious:—bitter, (most) rebel(-lion, -lious). The definition is very enlightening. When bitterness enters into the mix, it becomes crystal clear why people rebel. When we do not forgive others and become bitter over what they have done, rebellion becomes a scapegoat. They are wrong, we are right so we can rebel and be justified in our rebellion. What a terrible way that would be to live our lives. As we see when we study various rebellious children in the Bible, the end will never justify the means. Below are three examples of rebellious children in the Old Testament. And Miriam and Aaron spake against Moses because of the Ethiopian woman whom he had married: for he had married an Ethiopian woman (Numbers 12:1). Instead of forgiving Moses for marrying Zipporah (Exodus 2:21), they let a root of bitterness take hold, causing them to be rebellious children. Reading on (Numbers 12:2-10), God makes Miriam a leper. Aaron then pleads for forgiveness (Numbers 12:11-12) and the very person they spoke against, Moses, their man of God (Deuteronomy 33:1) intercedes on Miriam's behalf (Numbers 12:13). Miriam was fortunate because the man of God in her life interceded and God relented and only removed her from the camp of the Israelites for seven days before healing her. Leprosy is typology for sin. Just as sin is, leprosy is uncleanness (Leviticus 14:1-57). Just as God provided a way for lepers to be cleansed in the Old Testament, He provided a way for us to be cleansed today by robing Himself in flesh as Jesus Christ (1 Timothy 3:16), being crucified, being buried and rising from the dead, giving us the Gospel of Jesus Christ (1 Corinthians 15:1,2,3,4) to obey. Without receiving the cleansing that we receive by obeying Acts 2:38, the answer to the Gospel of Jesus Christ, we won't be lost for seven days like Miriam, we will be lost for eternity. And I am come down to deliver them out of the hand of the Egyptians, and to bring them up out of that land unto a good land and a large, unto a land flowing with milk and honey; unto the place of the Canaanites, and the Hittites, and the Amorites, and the Perizzites, and the Hivites, and the Jebusites (Exodus 3:8 ). The Lord is the one you and your followers are really revolting against! For who is Aaron that you are complaining about him?” Then Moses summoned Dathan and Abiram, the sons of Eliab, but they replied, “We refuse to come before you! Isn’t it enough that you brought us out of Egypt, a land flowing with milk and honey, to kill us here in this wilderness, and that you now treat us like your subjects (Numbers 16:11-13 NLT). We never want to challenge our man of God, but the height of stupidity would be for us to openly insult God. Korah said that Egypt, where they came from, was the land that flowed with "milk and honey", one hundred percent contrary to God's promise. As I wrote this, I prayed, "Lord help me never be so full of pride and bitterness that I would openly and stupidly insult you, in Jesus' name". Korah and his followers bitterness was towards Moses, and God, because they were not still in Egypt. The pridefulness that consumed them was that they believed that they were subject to Moses, without God having given Moses this authority. And the earth opened her mouth, and swallowed them up, and their houses, and all the men that appertained unto Korah, and all their goods. They, and all that appertained to them, went down alive into the pit, and the earth closed upon them: and they perished from among the congregation (Numbers 16:32-33). And the city shall be accursed, even it, and all that are therein, to the Lord: only Rahab the harlot shall live, she and all that are with her in the house, because she hid the messengers that we sent. And ye, in any wise keep yourselves from the accursed thing, lest ye make yourselves accursed, when ye take of the accursed thing, and make the camp of Israel a curse, and trouble it. But all the silver, and gold, and vessels of brass and iron, are consecrated unto the Lord: they shall come into the treasury of the Lord (Joshua 6:17-19). Israel hath sinned, and they have also transgressed my covenant which I commanded them: for they have even taken of the accursed thing, and have also stolen, and dissembled also, and they have put it even among their own stuff (Joshua 7:11). And Joshua said, Why hast thou troubled us? the Lord shall trouble thee this day. And all Israel stoned him with stones, and burned them with fire, after they had stoned them with stones (Joshua 7:25). Achan knew that he sinned against the Lord (Joshua 7:20) when he coveted and took what was the Lords. Not only did he break the covenant that God made with the Israelites before they conquered Jericho (Joshua 6:17-19), but he also broke two of the ten commandments - stealing and coveting (Exodus 20:15,17). He coveted and then stole what was God's. 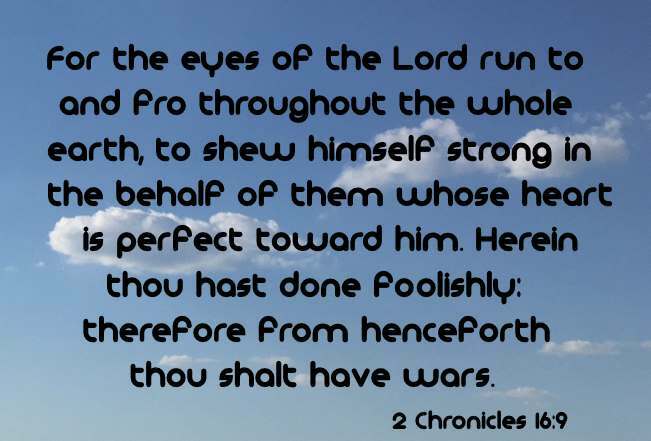 For the eyes of the Lord run to and fro throughout the whole earth, to shew himself strong in the behalf of them whose heart is perfect toward him. Herein thou hast done foolishly: therefore from henceforth thou shalt have wars (2 Chronicles 16:9). 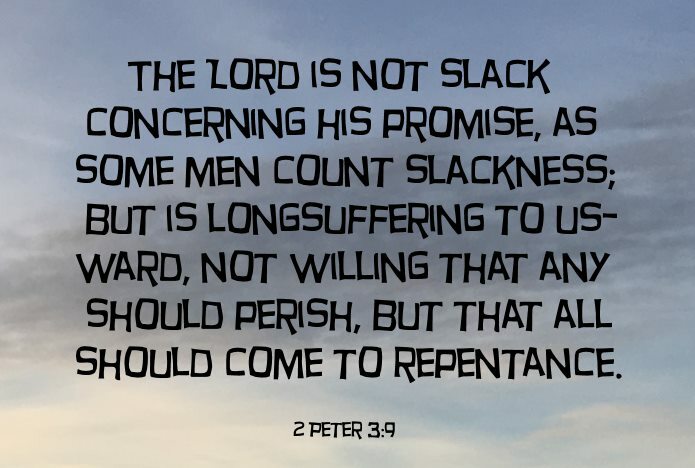 Jesus does not want us to perish, He wants all of to spend eternity with Him.